My tweets and Facebook post brought down the Peace of the Gospel conference and this is the story. It’s not a new story, but it comes with some specific questions for all of us whether or not you are religious. I don’t actually have the time to sit at my computer and call out every Christian conference with a line-up of all white platform speakers. There are variations on the theme – all Black male speakers, all Asian American male speakers, all white female speakers, etc., but most often it is the sheer lack of ethnic and racial diversity on stage and in the planning. So when yet another such conference was brought to my attention by a white male friend, let’s call him Brad, who actually had not noticed the all-white keynote speaker list, I was humbled by his reaction. Brad apologized for not noticing and asked what he could do. We both agreed that contacting the organizer(s) of the conference as well as any of the speakers would be a good start. Brad did his thing, and so did I. That was in mid-May when I invited my Facebook and Twitter community to contact the organizers of The Peace of the Gospel Conference for this blatant oversight, regardless of the specificity of mimetic theory. Peace of the gospel that doesn’t include people of color, especially indigenous voices, isn’t gospel peace. I am often asked, particularly by white allies, “What can we do to fight against racism and white supremacy in Christian spaces?” so I invited folks to contact the organizer(s) through the conference website and have their concerns registered. It was unclear to me at the time who the organizers were. There were no names on the contact form so I filled out the contact form, heard back from their web person and then heard from Michael Hardin. He asked if I wanted to speak by phone and suggested a time. I responded asking for other options since the timeframe he initially offered up didn’t work for my schedule. I never heard back from him. I write this because this is not my first rodeo in raising my voice and trying to speak truth to power – Deadly Viper, Rick Warren, etc. Every time I am asked why I didn’t handle things privately (try calling up Rick Warren privately), which assumes we are all on an equal, level playing field. Newsflash. The playing field was not created with equality and equity in mind. The playing field, even if we pray at it or read the Bible at it, was created with certain power dynamics in mind. A publicly advertised Christian conference does not allow for or require Matthew 18:15-17 treatment. However, when asked for a phone call I tried and never heard back. I have the receipts. A diversity statement was issued. I tried to offer any help I was told in so many words that things were being handled. Cool. And then I found out in September the conference was cancelled. So, I am not always known for my patience but I am growing in that area. Please take note that it is now the end of October. I found out about the cancellation in September because Brad contacted me about a disturbing email he had received about the cancellation. I am named in the email, blamed for assassinating the conference. I sat on this because I had never been singled out in that way and later realized that the email had been sent to conference registrants. I have no idea how many people received that email. All I know is that I didn’t feel safe. My posts about things like this often are public. My husband worries about that but supports me and agrees that this is part of what I am supposed to do, my “calling” in Christian-ese. So I focused on editing and rewriting my book, Raise Your Voice: Why We Stay Silent and How to Speak Up. Yes, it was time to do as I say. I hesitated to include the email because Asian American Christian women aren’t supposed to be confrontational, etc. and being abrasive or accused of assassinating anyone or anything doesn’t feel good. However, I decided to include it because the words and context matter. Diversity Statements – Corporate America was the blueprint for the Church’s diversity statements because too many of us Christians wrongly believed the gospel is separate from social justice and diversity. Apparently Genesis, Acts, I Corinthians and Revelation to name a few books of the Bible don’t actually speak to God’s intention behind diversity in nation, tribe, people and language. In that vein, issuing a diversity statement means about as much as a New Year’s resolution. You can put one out there but let’s see where you are at in a few weeks. Power and Money – My husband and I have some money socked away for retirement, but I predict we will die before we pay off the loans we have taken on to help our kids pay for college. Never mind the embarrassing amount of credit card debt we carry. So it is worth noting that Hardin’s email includes financial details, details that are not my problem but remind us that even in the Christian conference world there is money to be made and lost. It truly is the Christian Industrial Complex and the sooner we are wiser to it all the sooner we can be more critical about the systems out there and our own personal finances. Hardin also writes about his faithfulness to a call to sacrifice but appears to be displeased with his current financial situation. I can relate to the tension of living faithfully and wanting a vacation, and I am not always faithful or excited about raising my salary through individual donors. But that isn’t the point. The point is that we can’t claim to be faithful to Jesus’ call, cry poor when you say you chose that life, and then blame two women of color without ever examining your own privilege and power. Justice and peace are not achieved by tweeting and posting but both can be activated from whatever space we inhabit. I hesitated to write anything about this because it is exhausting – spiritually, physically, emotionally, mentally. Raising your voice is also dangerous. One of the more discouraging things is I find myself wondering who can I really trust? I don’t know if there were others who received this email and are connected to me virtually or IRL. All I know is that only Brad contacted me and for that I’m grateful. This isn’t a personal fight. This goes much deeper to embodied faith and theology, integrity, and witness in public and private spaces and how what we do and say in different spaces do or don’t align. So what does this have to do with you, my Dear Readers? The Blame Game – Please remember this actually isn’t about one person or a personal issue to be dealt with privately. How we chose to live out our personal beliefs in the public say more about us than about whom we claim to follow. If you received this email or know of others who are in this mimetic theory/theology crowd, how will you talk about the inherent racism and misogyny expressed in the fallout of the conference? When you see FB posts or tweets what will you do or say? Will you raise your voice or stay silent? Also, this isn’t a single incident. This will happen again. It probably happened today, and it’s not just conferences. Did you hear an offensive joke and let it go? Did you repeat an offensive joke and tell someone to get a sense of humor? Do you actually know why people are kneeling during the national anthem or boycotting the NFL? Diversity Statements – Words have meaning. Words are cheap. On a personal level you can say all you want, post all you want to look like an ally but at the end of the day your relationships and actions out there at work, at church, when you’re angry, when you’re tired and the line isn’t moving fast enough, etc. will tell the truth. It’s the same with churches and organizations. All are welcome just means you opened the door. It doesn’t mean you made the doorway or what people encounter inside actually welcoming. Ask me how I know. Power and Money – Do you go to conferences? Read books? See movies? Before you plunk down registration fees take a close look at the speakers, and, if you can find out, the planning team, the leaders, etc. Do they represent your personal values? Do they reflect the diversity of the kingdom of God? Does the way you spend money align with your values? Any other suggestions??? I could use some help here, and I’m still learning. Why? Because that’s bragging, and the only bragging I grew up with was hearing my parents brag about other kids and hearing other parents brag about someone else’s kids. There is no “us” or “we” or “honoring the family” in self-promotion. Even when I’ve thought I toned it down by talking about God’s call on my life and my ministry when years and years ago I was asked to share about my job with InterVarsity I was told by a church leader that he was surprised and disappointed in me for only caring about myself. The message has been to wait for someone else to promote me if that person, who is more credible, respectable, connected, etc. chooses to do so. Is it fair? That used to be the rhetorical question. For me it’s not about fairness anymore because I get too emotionally hooked right there. I want to move the conversation to understanding leadership. Leaders, and I count myself in that broad category, need to have a level of self-awareness – our strengths, our weaknesses, our blind spots, our junk, our humanity, our passions. You get the picture. That also means understanding our influence. I am still learning, but in the meantime I have been blessed by advocates who understood and did not shy away from relational, influential leadership as a way to bring diverse, new voices into the fold, mine included, even when those voices aren’t proven on the big stage. 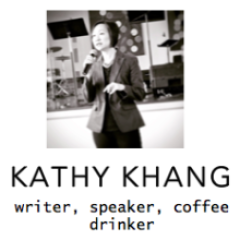 So I was recently asked by web strategist DJ Chuang if I’d be willing to start a list of Christian Asian American female leaders who would be great resources for other leaders, churches, conferences and organizations who are sincerely and actively looking for what I would call “new to them” voices and leaders for conferences, strategy meetings, etc. Because I can’t be the only one who is tired of hearing “we didn’t know who else to invite/ask/promote”. This is not an exhaustive list. I need your help. It’s pretty clear to me where some of my blind spots and limited networks are. Who would you add? If you’re not sure, who do you know who might know? Step up. Speak up. Advocate and lead, my friends. This certainly needs to be a longer list…and I’ll add links in between “Mommmy?” requests from my homefront.